"You know what's weird? Donald Duck never wore pants. But whenever he's getting out of the shower, he always puts a towel around his waist. I mean, what is that about?" — Chandler, Friends note To keep the floor from getting wet! But if your characters are Funny Animals, you are bound to run the gamut of animals until you hit unfamiliar ones. A full outfit has a high chance of obscuring what species a character is, so you're bound to find just enough clothing to make it quirky to that character without covering up the most basic cues, with the major exception of White Gloves. Characters with distinctive tails might not get pants, and ducks are rarely given shoes. Some half-dressed cartoon animals wear shoes, but others do not. Also, shirtless ones are more likely to wear shoes than pantless ones. Pantless or Bare-bottomed: wears a shirt, coat, vest, or some other kind of top, but no pants, shorts, or overalls, or a skirt and very rarely with any underwear on.note A shirt or any other kind of top without pants, shorts, overalls, or a skirt but with underwear would border on fully dressed if the underwear looks enough like shorts. This also refers to characters wearing dresses or skirts (even long ones) with shirts but without underwear. This variant is more common in male animals than in female animals. Shirtless or Bare-chested: wears pants, shorts, overalls (which often border on fully dressed), or a skirt, but without a shirt or any other kind of top. Some characters wearing skirts without shirts are not wearing any underwear. Some characters of this type wear vests in such a way that the chest isn't covered, which can border on fully dressed. This variant is a lot more common for female characters than the pantless variant. Overlaps with Walking Shirtless Scene. The majority of half dressed cartoon animals are on the Civilized Animal\Funny Animal tier, but half dressed cartoon animals can range from Nearly Normal Animal to Petting Zoo People on the Sliding Scale of Anthropomorphism. However, as Petting Zoo People have more humanoid bodies than the lower tiers, they can look very unnerving to some (Especially if they are nearing Borderline Little Bit Beastly tier). As a result, pantsless and shirtless PZP aren't very common. Excalibur of Soul Eater only wears a shirt and top-hat, though he's not an animal. This is lampshaded in his first appearance when Black Star immediately asks what he is and why the hell he's not wearing any pants. Panther Lily and Lector in Fairy Tail. Luna from Happy Happy Clover is the only character who is seen wearing clothing, at least in the original manga. In the anime, Clover & Friends are seen wearing red hoods during the winter which wasn't present in the original manga. 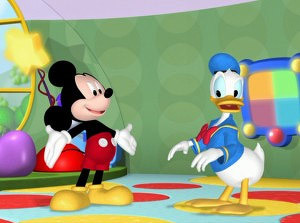 As with the Trope page quote, Dutch comedian Harry Jekkers mentioned the fact that Donald Duck wears no trousers during one of his shows in the early nineties. In fact, he points out that a Duck, while walking as a normal human being, wears no pants. What follows is his outrage when he points out that when this same Duck is in his natural element — swimming in water — he suddenly starts wearing swimming trunks. Cue laughter from audience. Zak (when separated from Ko), Pakko, and Makko all wear shirts but no pants. Takko and Jakko Zarner also wear shirts but no pants. Averted with Jot, Zot, Sikko, Coach Nurse, Sekoila, and the Yarner twins. They are all Barefoot Cartoon Animals. Subverted with Dot, who is revealed to wear a black shirt in the first episode ("The Blue Dot" segment), making her a Barefoot Cartoon Animal as well. In Hail to the King, the unnamed protagonist is a human who wakes up in Equestria in King Sombra's body. He comments on how he has an awesome armor and cape, but no pants. In A Sly Encounter, a Sly Cooper and Sonic the Hedgehog crossover comic plays with it, when Sally is confused why people would need privacy when dressing, with Sly insisting on her wearing pants and a shirt. He squicks himself out when thinking about Murray without pants, and (as he is a hippo) without fur. Halfway through Alvin and the Chipmunks, the chipmunks start to wear just sweaters/sweatshirts, though Simon wears glasses. Bedknobsand Broomsticks In this Disney live action animated movie. Miss Price, Professor Emilius Browne, and the 3 children accidentally go visit, underwater in the ocean by the isle of Naboombu. There they see half dressed fish underwater, when their bed gets pulled up by a fishing hook, they arrive on the Isle of Naboombu and they meet a sailor bear who wears a shirt but no pants or shoes on. They go visit the Lion King Leonidas who has a soccer match. Most of the animals at the game wears both a shirt and shorts but only one doesn't wear shorts such as the alligator. Also the Cheetahs shorts fall down before he pulls them right back up. Some of the Animals sitting in the Bleachers only wears a shirt but no pants. Early cinema's Le Cochon Danseur , a 1907 short film based on a popular French vaudeville act. The pig even uses a Modesty Towel when his waist coat is pulled off. Kangaroo Jack Charlie and Louis run into a kangaroo with their truck. Louis then puts his red lucky jacket with the $50,000 in the jacket on the kangaroo and take their pictures. The Kangaroo then wakes up and takes off with Louis red jacket and they go on a wild chase after the Kangaroo wearing only the red jacket with money in it. The 2018 film adaptation of Peter Rabbit features the main character in his iconic blue jacket. Contrary to the books, this trope is also applied to most of the supporting talking animal characters, wearing only a shirt, blouse and/or jacket. Star Wars: In a variant, The Phantom Menace suggests droids view their outer coverings as clothing with C-3PO embarrassed about being "naked". In Police Force, the villains and civilians are Funny Animals who wear little to no clothing. Daniel Striped Tiger from Mister Rogers' Neighborhood wears a wristwatch. Homestar Runner does not seem to wear any pants, but he does wear a shirt, shoes (that look exactly like his feet, but with blue soles stuck to them)Proof A certain shot in In Search of the Yello Dello. and a propellor cap (he calls it his "buzzer"). Also, Marzipan's ancestor, Old-Timey Marzipan, seems to wear a skirt... but it's actually her body. Strong Bad lampshaded this on one occasion. In one Strong Bad E-Mail , Homestar claims that he always wears long white pants. Strong Bad also lampshades the apparent "soles stuck to the bottom of his feet". Whenever Homestar is shown shirtless, his entire torso is censored via pixellation, with two exceptions: In Strong Bad's fan fiction in the Strong Bad Email "fan club", Homestar is just wearing a fig leaf, and in the 2014 Halloween cartoon "I Killed Pom Pom!" Homestar dresses up as Tobias Funkë, wearing nothing but cut-off shorts and blue skin paint. It gets even weirder when Strong Sad, who doesn't seem to wear any pants (or anything for that matter), is rather concerned about buying his favorite underwear back from an online auction in "Bug and Mouth Disease". Strong Bad: Hey, I always wondered, is your skin green or are you wearing a green body suit? Y'know with footies and sockies. Coach Z: Oh, I got footies alright... athletes' footies. The Annoying Thing/Crazy Frog is often depicted with only a leather jacket, helmet, and goggles. This is a bit of a subversion in that unlike almost all others the Crazy Frog has visible naughty bits.note Eventually, though, the Crazy Frog commercials had a black censor bar. Many college mascots are animals clad only in a sweater bearing the school's initials. Likewise, a good chunk of fursuiters either wear a shirt or shorts/pants. Sometimes the article of clothing is part of the costume, as in the costumer never bothered to make legs or a complete torso for it (both to keep costs down and make it less hot to wear), letting the clothing hide this fact. In at least one case, Winnie the Pooh's half-clothed nature was considered Serious Business when a conservative Polish council opted to exclude him from a playground on that basis .